Patented Batgirl Chair Cape™ adjusts to most sized chairs! Decorate your office chair or party with this patented Chair Cape™. Entertainment Earth brings excitement to your boring chair! 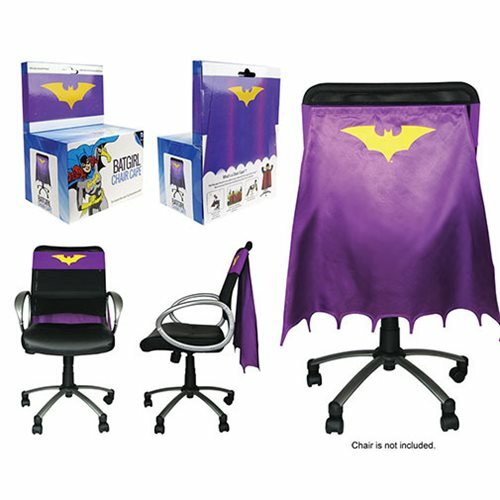 Be the hero your office deserves by transforming your chair with the Batgirl Chair Cape™, the patented product from Entertainment Earth. Made of high quality fabric materials, this Batgirl Chair Cape™ is 24-inches long and 30-inches wide. It includes an adjustable hook and loop based belt and strap that will fit most size chairs. The classic yellow Batgirl emblem is prominently displayed on the lavender cape that also features pointed arches. The same emblem is also visible on the adjustable lavender chair strap. Order now and be the envy of your office! Ages 14 and up.